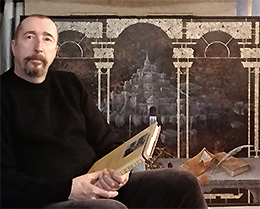 Luigi Martinengo Cesaresco was born in Brescia in 1950. He has always been attracted by the world of art in all its forms. Music and painting were his favourites but in the end, his great love remains painting. In the 60's he was a student of Prof. Oscar Di Prata who appreciated and encouraged his first steps in the direction of becoming an artist. At the same time he began to frequent the studio of Maestro Franco Bertulli, at the time one of the best known painters of Brescia, with whom he established a relationship of deep respect and friendship. It was Bertulli, who encouraged him to engage himself in the study of painting. In this way, despite the difficulties of choosing a career in the arts, he began attending drawing and painting classes at the 'Scuola Superiore delle Specializzazioni Moderne' (School of Modern Arts). Then he attended the 'Liceo Artistico' (Art School) and after obtaining the Artistic Certificate, he enrolled at 'Accademia Delle Belle Arte Carrara Di Bergamo' (Carrara Fine Arts Academy in Bergamo). In those years, he became active in the profession, expressing interest in the fields of advertising and design, and founding a graphic studio with a friend. Later, he devoted himself permanently to the difficult profession of painter. Occasionally, he taught drawing and art history at state and private institutions including for a few years at the 'Scuola dell’Artigianato' (School of Crafts) in Brescia. 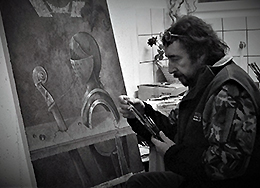 Since the end of the 80’s he collaborates with the City of Brescia as a teacher of drawing and painting courses. At the same time his travels to various countries in Northern Europe grew more frequent. His favourite places are found in the north of France, between Normandy and Brittany; in those places steeped in history and mystery, his passion for everything that is great and mysterious grew. 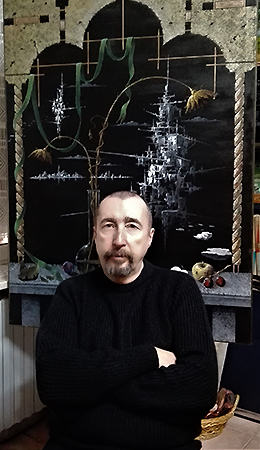 His passion for travelling will never subside, it provides an opportunity for long stays abroad, even in places far away and it is this passion, which influences the creation of his work: his paintings are hard to classify in a default scheme but surely can be placed in an area that ranges between dreamlike and surreal. Over the years, he has worked for clients in various countries of Europe, USA and Japan. Graphic, mixed techniques, graphite, ink, oil, acrylic, fresco. First drawing, and later painting were important parts of my childhood. For as long as I can remember, shapes and colours have been my favourite means of communication. Combined with music and literature they nourished my spirit. "There is no certainty of tomorrow," the great Lorenzo de' Medici wrote in his Canzona di Bacco (one of the Canti Carnascialeschi). The moment you accept this condition, you agree that every day of your life unravels before your eyes, full of surprises. You get to look at the world every day with curiosity and hope, like a surprised and impatient child, absorbing new faces every day. I also believe that curiosity is vital to the life of an artist, so nothing is lost in indifference! In my surreal dream-paintings, there are three constant elements: The Dream, the Journey and the Tale. Three essential components that interact with each other: they create images and stories which are always different: from myth to history, from science to psychoanalysis, never forgetting the 'aesthetic’. If you really want to express yourself through the art of painting, the real art of painting, which is made through dexterity of the painter, I believe that technical aspects and aesthetic are always present. When these two components are combined, they allow, despite the times and fashions, producing works that can still, without doubt, be called: "Painting". I realize that often, in the eyes of those who look at my paintings, the content is not easy to read or understand. It is equally true that almost everyone can feel certain sensations standing in front of them. From the moment that I saw that my paintings could communicate with people, conveying their feelings, I was convinced that I had taken the right path. It pleasures me greatly that viewers frequently see parallels between my paintings and fairy tales. In most of my works in fact the story is dominant, which is manifested through the rich symbolism contained in a single image. It forms a single frame of a long movie, that when patiently observed, shows the many elements that make up the plot. Story and picture together allow a visual journey, which cannot be written down definitively, because it contains an infinite number of sensations influenced by the unique perception of each viewer. Therefore, through my "painted stories" I would be happy to introduce you to my work, showing you the mysteries revealed by my world, hoping you'll find them interesting. 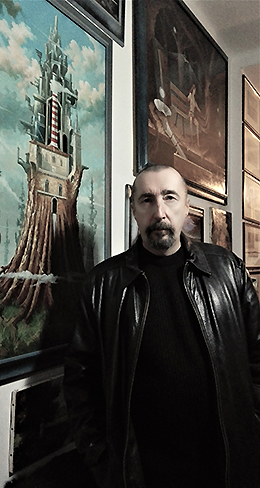 According to Luigi Martinengo Cesaresco, l 'Onirico Surreale (as he often likes to define his painting), are an eternal journey between Dream and Reality, speaking of unknown universes, of forgotten places and ancient myths from the immense depths of time, projecting into the future that inexorably runs towards us, the eternal repetition of the cycles of life. In his paintings and dreams, he creates parallel and magical worlds populated by unlikely characters and mythical creatures. His creativity is expressed and flies free, every painting is the tip of an iceberg that is being held up by the invisible mass below. The paintings are developed using symbols and images, slowly revealing the weight of the tale that generated it. This conveys to the unwary observer fascinating and at the same time unusual images. Abnormality that causes a suspicion: A suspicion that these images are the result of mangled thoughts that give life to a subtly distorted reality which is difficult to pinpoint on a conscious level. More is sensed than is detectable. The beholder unwillingly becomes an explorer, traveling through unknown worlds, meeting unlikely characters and thereby assisting, without any possibility of intervention, in timeless events. Past, Present and Future, are woven inextricably through space and time, where anything and its opposite are possible. At first glance, the viewer may experience some difficulties in identifying the key problems in these stories. The mystery is then suddenly revealed, the truth becomes evident and everything acquires meaning and reason. Finally, the spirit of the traveller, after the discovery provoked by Tale, may return peacefully to the current emotions that the painting evokes in him. Painted stories unroll without words through pictures, finding their relevance in their topics forming never-ending pictorial cycles. Pictorial cycles always remain open, waiting for new pieces to be added to the composition of their huge mosaic. Old and new cycles such as: "Insects Mechanics", "Urban Harvester Structures", "Parallel Worlds", "Tales of the Walls" or "Ordinary and Extraordinary Reality" etc. "GIVE US THIS DAY OUR DAILY DREAM"
And it is in these dreams that we can meet the Mysterious Inhabitants who live beyond the mirrors, the ones that always exist in the deep shadows of the twilight or in the equally deep sunny summer afternoons, that animate the wet spots of old walls and are invisible to the eyes of most, yet always watching us. Oil, Acrylic, Mixed Media, graphite or ink, always characterized by an unmistakable and clear descriptive section. This will allow all viewers to participate in the Mystery. All images and written content on this site, are the work of LMC and his intellectual property. They are as such protected by the laws on copyright. Their use, partial or in entirety, for any reason or in any form without the express permission of the author is not allowed. © 2017 webdesign: Reka Irk. All Rights Reserved.